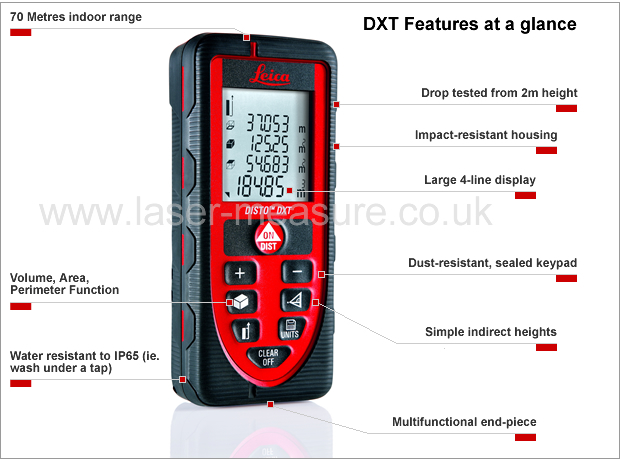 Many manufacturers talk about robustness, only few go to such lengths as Leica Geosystems: The Leica DISTO™ DXT is the only laser distance meter which is protected against jet water, completely sealed against dust (IP65 Certified) and dropped from a height up to 2m to demonstrate its robustness. The housing and keypad are specially sealed against water and dust. Cleaning under running water is no problem. The Leica DISTO™ DXT has a diverse range of functions, e.g. addition, subtraction, area, volume, Pythagoras, continuous measurement and minimum/maximum measurement. The sensitive measuring elements are protected by solid rubber parts. 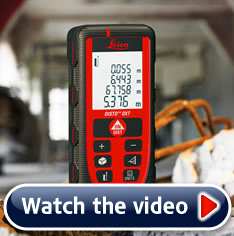 The Leica DISTO™ DXT is therefore particularly resistant and endures drop tests from 2m height. With its sealed and flat keypad, the device can be easily cleaned by holding it under running water. On the inside, it is strengthened with special fibreglass-reinforced plastic bracing. Thick rubber housing on the outside protects the module against possible damage in case it is dropped. These features make the Leica DISTO ™ DXT the ideal measuring instrument for daily use on construction sites. Another key feature is the proven multi-functional end piece with automatic position detection. Irrespective of whether measuring is carried out with the end piece in or out, the correct distance is automatically detected and displayed, avoiding tiresome measuring errors. The Leica DISTO ™ DXT has a number of other useful functions, such as continuous measuring with display of minimum and maximum, as well as fast area and volume calculators with additional information for wall and floor area or perimeter. Keys for subtraction and addition, as well as a Pythagoras calculation for indirect measuring are all there too. A memory for the last ten measurements completes the functionality of the device, allowing you to take several measurements before entering them into your plan. It goes without saying, that distances can be measured precisely to an accuracy of 1.5mm with the Leica DISTO ™ DXT; true to the Leica Geosystems standard, "when it has to be right". 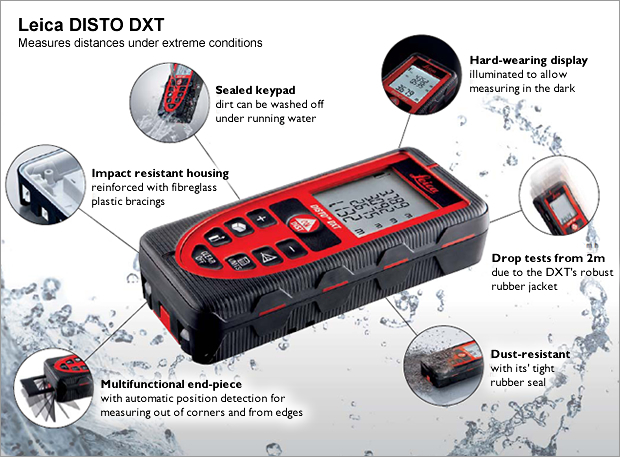 I have just received the DISTO DXT laser measure and I am impressed with the design. We have dropped a number of Leica Disto laser measures and although their were fairly robust this looks like it will last us for years. Thank you for making us aware of the New Disto DXT and very fast delivery. Thank you for sending my Leica Disto DXT laser measure so quickly. I like the new designed side entry case for my belt and firm grip / rubber casing. Thank you for your speedy service and telephone advice. 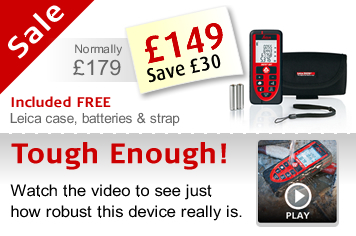 The Leica Disto DXT is ideal for our environment and has already saved me a great deal of time.